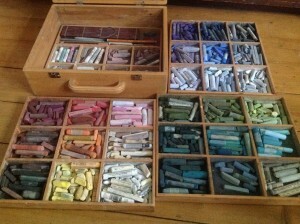 Since 1994 when I first discovered this medium, I have been adding to my collection of pastels. From a basic starter set, I have constantly been searching for those elusive ‘English’ landscape colours. Every time I visit an art shop I head straight to the section that displays individual pastels, as excited as any child in a sweet shop! I have samples from many manufacturers, the important thing for me is always the colour. This was my first box quickly filled, each of the trays arranged by colour and tone and although I used it for many years, it is far too heavy to carry to and from workshops and demonstrations so it now remains my ‘store’ cupboard. 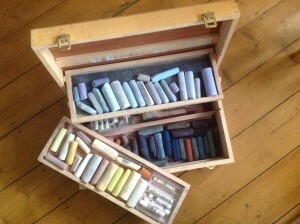 Perhaps my favourite box, this contains a selection of ‘jumbo’ pastels in my most used colours plus a few smaller ones in both the lightest and darkest tones. The large pastels allow me to apply large areas of colour quickly before I move on to detail. Rapid results. In my studio I use a customised tray on wheels, designed and made by my son. 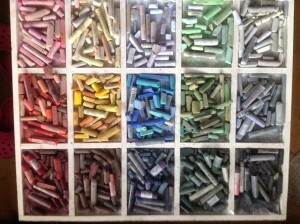 Again arranged by colours and tonal values, when not in use I can roll it away under my desk. This small portable lightweight box contains all the colours I require for a demonstration or outdoor work. Inexpensive and readily available from any DIY store, perfect when starting out.